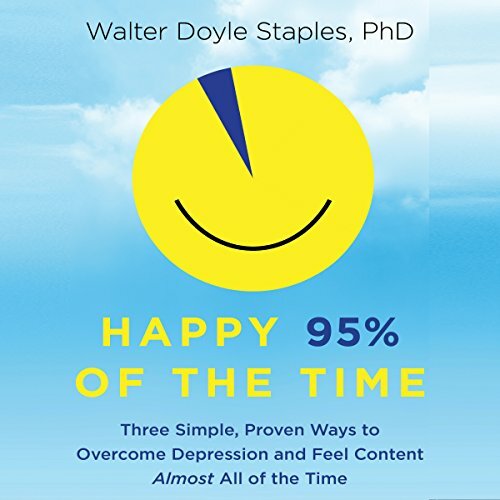 In his latest book, Walter Doyle Staples invites his listeners to experience life as fully aware, fully conscious, and fully functioning individuals. Dr. Staples presents powerful and life-changing ideas and concepts on how to transcend our ego-based state of consciousness to achieve deep peace, profound love, and infinite joy. Happy 95% of the Time explains how our attachments to our egos can only create dysfunction and suffering in our lives, resulting in fear, anger, guilt, regret, depression, and/or despair. He contends we need to awaken to a new consciousness and experience a new beginning. Cognitive behavioral therapy (CBT) - an example of Western left-brain, analytical thinking. Practical spirituality - an example of Eastern right-brain, mystical thinking. Mindfulness meditation - an inner-body, contemplative approach designed to manage our internal thought processes in order to calm the mind. Numerous world-renowned authorities on personal success - from Jack Canfield, Ken Blanchard, and Dr. Norman Vincent Peale to Art Linkletter, Anthony Robbins, and Brian Tracy - have praised Walter's previous books. We are sure they - and you - will find Happy 95% of the Time just as valuable and compelling. Generic psychobabble "if you believe, you can do anything, just don't ask me how." kinda book. Totally lacking in depth. Don't let the PhD next to author's name fool you. He doesn't have a PhD in psychology but in business. I wonder what made him thank that he qualifies for writing a book on happiness and CBT. The narrator is robotic. Skip this one.